Experience the precision of a traditional Japanese chef knife. The Simple Song 8" gyuto chef knife is expertly crafted and designed to give any chef, whether professionally at a restaurant or at home in the kitchen, the ability to experience the gracefulness a traditional Japanese knife offers it's wielder. From simple meals at home to the rigorous environment of a restaurant kitchen, this chef knife works to bring out the best in you by providing it's user dependable edge retention, balanced precision and unmatched sharpness. If on your journey you should encounter GOD, GOD will be cut. The Simple Song traditional Japanese chef knife begins its forging process from a single piece of premium high carbon stainless steel imported from ThyssenKrupp. Specifically sourced for its ability to maintain an incredibly sharp edge from proper heat treatment while being extremely resistant to stains and wear. Each blade is precisely 210mm and sharpened to a 15 degree edge on one side - just as the traditional Japanese chef's knife of old, to deliver nimble handling and ultra-sharpness. 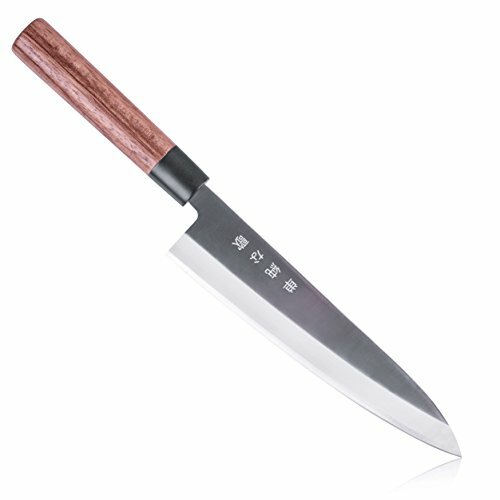 Gyuto, which literally translates to beef-sword, is a design made for easy work of chopping or dicing vegetables, cutting stiffer meats such as pork belly or the sawing back and forth of larger cuts such as beef, this knife can handle it all. Be confident that you are getting the optimum performance when it comes to this Gyuto Knife. Balanced handling is just as important as having an edge the will stand up to the rigors of the kitchen. The Simple Song gyuto chef knife features a beautiful traditional handle with imported Rosewood from Madagascar to complement its blade. Simple and elegant, the traditional rounded handle compliments any grip for expert maneuverability. A full-tang design allows the blade to run the length of the handle which adds to the durability of the knife, balance of the handling and weighted handling. HIGH QUALITY STAINLESS STEEL: Our 420HC stainless steel blades are heat treated for optimum hardness and edge retention while maintaining the ability to be sharpened to a razor edge. The steel used is perfect for kitchen specific tasks because of its corrosion resistance, preventing it from oxidizing with rust when it comes to contact with meat, fruits and vegetables. Our steel blades run the length of the knife and through the handle for a full-tang design. SINGLE BEVEL KNIFE EDGE: Traditional Japanese knives in the hands of premier chefs are usually of a single bevel ground edge in order to give the most precise and sharp edge. Our blades are meticulously sharpened to a 15° edge on the right side while the other side remains flat. A conventional Compound edge is sharpened on both sides usually resulting in a 30° edge which is not as sharp. Our design gives you an incredibly sharp edge while you cut and a flat side helps to separate food slices. FULL-TANG TRADITIONAL ROSEWOOD HANDLE: We wanted the handle of our knives to be able to remain in great working condition and maintain the test of time through use and ware. We thought of no other material to use in our handles than Rosewood. Praised for its natural ability to be strong and heavy while being able to maintain a polish. Using Rosewood and our full-tang knife design allows the blade to run throughout the Rosewood handle, giving you a balanced feel when manipulating your knife. DESIGNED FOR CHEFS: Gyuto which translates to literally "beef-sword" is usually known in the professional western cuisine as the chef's knife, this is the be-all-end-all knife for would be chefs. It's versatility and length allows for proper use when cutting vegetables or long strokes for clean sashimi slices. Tackling tough meats such as pork belly or needing a sharp edge design for sinewy meats, this knife does it all with grace and professionalism. SATISFACTION GUARANTEE: You satisfaction is our GUARANTEE. We are so confident that you will love your Traditional Japanese Professional Chef Knife that if you don't feel the same way we do, you can contact our customer support team within 30 days of purchase and request a return, we will refund you the total amount paid for the knife. If you received a knife with any imperfections, you can also contact our support team and we will issue a return and send you a brand new one in the mail. If you have any questions about this product by Simple Song, contact us by completing and submitting the form below. If you are looking for a specif part number, please include it with your message.